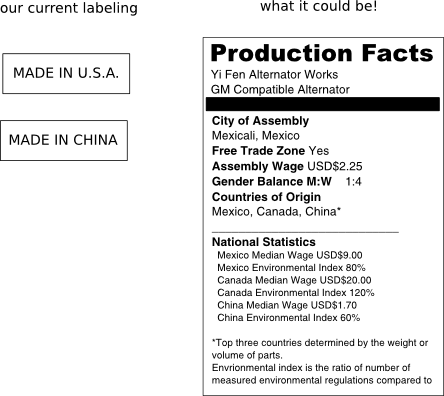 Product labels for the globalized economy. We need labels that tell us more than the country of origin. Back in the 50's, "Made in USA" meant something - but that's because most products made here were composed of other parts made here. Then, the neoliberal right wing started to attack at tarriffs, and before long, we saw our exporting businesses vanishing, often going overseas to become importers. Now that most of our products are made in another country, and those are made up of parts from global sources, it behooves us to reconsider product labeling. In the 1930s, Country of Origin Labeling laws were passed forcing companies to put the country of origin onto manufactured products. Above is an artists conception of what the label could be.